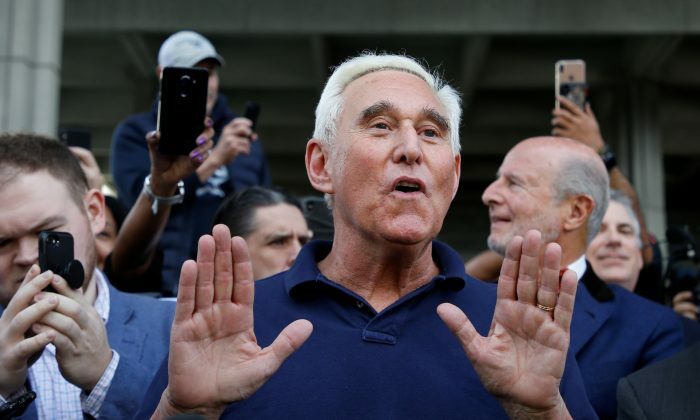 Political strategist and self-ascribed dirty trickster Roger Stone pleaded not guilty on Jan. 29 to charges brought forth by special counsel Robert Mueller. Stone was arrested Jan. 25 during an early morning raid at his home in Florida and released hours later on $250,000 bond. His lawyer, Robert Buschel, said Stone pleaded not guilty to the charges of making false statements to Congress, obstruction of an official proceeding, and witness tampering. All of the charges against Stone are unrelated to President Donald Trump or his presidential campaign. Mueller is investigating allegations of collusion between the Trump campaign and Russia. To date, the special counsel hasn’t charged anyone with collusion. Stone smiled as he passed through a gauntlet of reporters upon arriving at the courthouse. The indictment said Stone told members of Trump’s 2016 presidential campaign that he had advance knowledge of plans by the WikiLeaks website to release damaging emails about Trump’s Democratic opponent, Hillary Clinton. The indictment doesn’t allege that Stone had actual knowledge about when the emails would be released. The indictment also didn’t indicate whether Stone knew that Russians had stolen the emails by hacking into computers used by Clinton’s senior campaign adviser, John Podesta, and the Democratic National Committee. Last year, Mueller charged 12 Russians accused in the hacking as part of his investigation of Russia’s role in the 2016 election. The charging documents in the Stone case said a senior Trump campaign official “was directed to contact Stone about any additional releases and what other damaging information” WikiLeaks had about Clinton’s campaign. There is no allegation in the indictment that Stone actually communicated with Wikileaks. WikiLeaks, through its official Twitter account, stated that the Stone indictment is further proof that Stone had no “back-channel” with WikiLeaks. Pollack also pointed out the Mueller’s team has never interviewed Assange. Trump has called the investigation a witch hunt and has denied any collusion. He has also questioned why his allies are being prosecuted while those who oppose him haven’t been charged with similar crimes. “If Roger Stone was indicted for lying to Congress, what about the lying done by Comey, Brennan, Clapper, Lisa Page & lover, Baker, and soooo many others? What about Hillary to FBI and her 33,000 deleted Emails? What about Lisa & Peter’s deleted texts & Wiener’s laptop? Much more!” Trump wrote on Twitter on Jan. 26. Russia has denied the U.S. intelligence community’s finding that Moscow interfered in the U.S. political arena. Acting U.S. Attorney General Matthew Whitaker on Jan. 28 said Mueller’s investigation was close to wrapping up and that a report is expected soon.